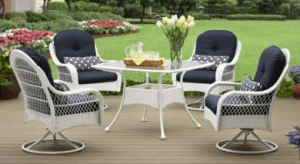 Having a medium sized outdoor space will allow you to look at the classic looking Azalea Ridge white resin wicker patio furniture collection from Walmart. This has the look of wicker and will last for a very long time with the powder coated steel frame. Three different sets to choose from and several matching pieces will give you the rich look without the high price. Now lets look at each item in this collection and see what it has to offer for your outdoor space. If you have need for a four seat dining set this set with four swivel chairs with a square dining table will work well in spaces at least 10 X 10. The chairs will give you 21.5 inches between the arms and will support 225 pounds each. They swivel to let you get out from under the table in smaller areas, but do not rock. The table is 42 inches square and 28.5 inches tall. The top is tempered glass for safety and has a hole for a patio umbrella. The wicker panels hold the legs together and gives the table support. Could use another umbrella support between the wicker supports. The navy blue cushions are 4.5 inches thick on seat and back. The lumbar pillows are 21 inches long, 9 inches high and 4 inches thick. This set will take about 1 to 2 hours for assembly depending on your abilities. Listed as a bistro set, the table is not big enough in my opinion to be a bistro table. This set should be classified as a chat set. It comes with the same chairs as the dining set with the side table. This set will be great for a balcony or any smaller outside area. See more information on this set in my post here. The conversation set will have two straight leg chairs, a coffee table and love seat. This set could be used on a 8 X 8 deck if you had the pieces close together. The chairs have 23.5 inches between arms for sitting. The frame has four solid legs and will support 225 pounds. The love seat has 47.5 inches between arms, enough room for two normal sized butts. The arm and leg design matches the chairs. The table is 40 inches long, 24 inches wide and 19.75 inches tall. The top is tempered safety glass, it does not have a hole for umbrella. The wicker shelf connecting the legs will offer book storage. The navy blue cushions will be 6 inches thick for comfortable long term sitting. The two throw pillows are 15.5 inches square and 6 inches thick. See my review of this conversation set here. 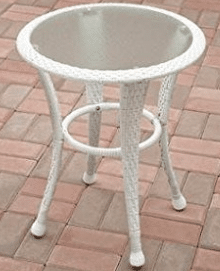 The side table is the same table that is in the bistro set. The two round supports attache the legs. The round top is tempered glass and will fit in the top round support. The table is 20 inches across and 24 inches tall. It will be a great addition to any sitting furniture in this collection. See this and other side tables in this article here. This rocker will look great as a pair on any front porch, add the side table and you will be able to relax and drink your favorite adult beverage and rock the day away. The chair will give you 21.5 inches between the arms and will support 225 pounds. Style is just like the sitting chairs in the conversation set with rockers on the bottom. Cushions are 4.5 inches thick with a 21 inches long, 9 inches tall and 4.5 inches thick lumbar pillow. Need to replace your porch swing or have a frame without a swing, this would be a great replacement. The swing is supported by a chain that is supplied. Some customers opted to get a larger chain to support their swing. The seat is 44.5 inches wide for room for two. The swing will support 450 pounds, this will depend on the mounting for the chain. You must have proper mounting to make this swing safe. The cushions are 4.5 inches thick on the seat and 4 inches thick for the back. 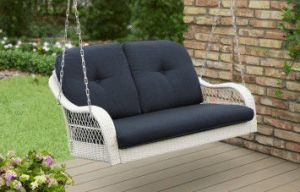 The great thing about this swing is you can mount to the roof of a porch or purchase a separate swing frame for mounting. 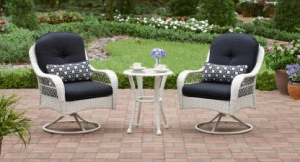 If you like the look of white resin wicker patio furniture, then the Azalea Ridge furniture collection will work for you. I like the look of the navy blue cushions on the white wicker, it gives the look of royalty. Having a small dining set and several options for sitting, this set will work for a lot of folks. The powder coated steel frame will give many years of use. The resin wicker can be fixed if ever broken by weaving new sections into the current weave. If you found this information helpful, please share with your social network. I like your styles those are very good ideas. Looking like i would definitely want one of those swings setup in my backyard. You know sometimes when you want to just relax for a moment and enjoy the moment free from all your cares, please add more outdoor options. Your photos are of high quality and the angles are great just add some more. 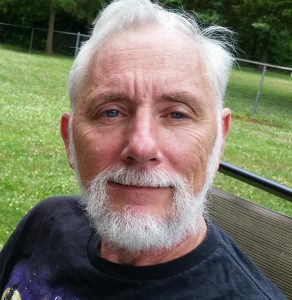 Thanks for the comments, keep coming back new post added weekly. My first thought when I saw the pictures of this white and navy set was “WOW, those are gorgeous! I love them!” And the more I read, and the more options I saw, the more I’ve fallen in love with them. Any idea if they also have a lounger style? If not, I think the rocker idea is amazing. Do you also know how waterproof the cushions are? The one thing I don’t like about outdoor furniture with cushions is that I’m constantly worrying about mold. Thanks John! 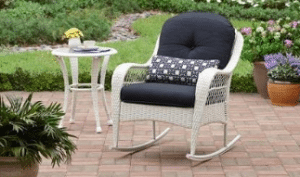 The White with navy blue Azalea Ridge collection does not come with a lounger at this time. The Brown collection does. The cushions are made to not mold if you let them dry properly after getting wet. Storing them when not in use is the best solution if you think this might be a problem in your environment. Spring is just around the corner. Having some seating and dining items for a small space is what it is about. These would be a great combination.